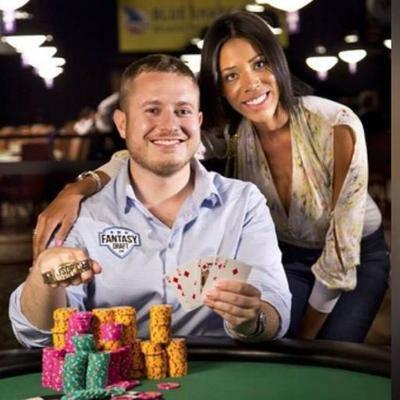 American poker pro Brian Hastings claimed his second WSOP bracelet this weekend, earning him the esteemed title of 2015 WSOP Seven Card Stud World Champion. On Saturday, Brian went head to head with 2x WSOP bracelet holder Scott Clements. In the end, it was Hastings who snagged the bracelet and 1st place prize of $239,518. A high-stakes cash game expert, Brian Hastings has harvested untold winnings from his true passion, but the live tournament arena has treated him phenomenally well. With Saturday’s victory, his new live tournament career total rises to $1,680,025. According to HighStakesDB, Hastings has also raked in $3.89 million playing online at Full Tilt Poker between March 2008 and April 2011 (Black Friday). At just 26 years of age, Hastings has cashed in 14 WSOP events throughout his short career, including four cashes in the 2015 WSOP alone. Just last week, Brian barely missed the final table of the $3,000 Limit Holdem 6-Max, pocketing $21,684 for a 7th place finish. He also placed 104th in the $1,500 No Limit Holdem 6-Max ($3,610) and 9th in the $5,000 No Limit Holdem event ($11,523). Hailing from Hanover Township, Pennsylvania, Brian Hastings acquired his first WSOP bracelet in 2012 when he triumphed over the field of the $10,000 No Limit Holdem Heads-Up Championship. He took down Jason Mo at the final table to claim the top prize—and his largest single live event cash to date—of $371,498. Hastings entered the final table of the 2015 WSOP Seven Card Stud Championship with the highest stack, and was still in that position when it came down to the final three. Hastings wouldn’t have an easy time of it though, facing off with the likes of Scott Clements and Daniel Kelly; both 2x WSOP bracelet winners. As the battle drew on, it was Clements who knocked Kelly out of contention, sending him home in 3rd place for a respectable $92,691. That left Clements and Hastings to fight it out for 1st, and again, Brian found himself holding the majority of the chips; nearly 2-to-1 over Scott. It took just over 40 minutes for the PA native to claim the title of Seven Card Stud World Champion. On what turned out to be the final hand of play, Clements was down to just 130,000 chips to Hastings’ 2.6 million. Clements had a great hand underneath, peeking down at A♠–K♣, while Hastings held 2♦–5♦. As the board played out, Hastings made a Flush in diamonds with his first 5 cards. By 6th street, Clements was drawing to a higher Flush, but mucked on the final street. And with that, Hastings claimed all the chips, the 1st place prize of $239,518, and his second WSOP bracelet. Clements was denied his third piece of WSOP jewelry, but did receive an impressive $148,001 for the 2nd place finish.